Are you sitting down? Of course you are, because you are at work (or home) reading Jalopnik instead of being “productive.” Well, I’m about to make your Friday even better. As a Jalop you most likely are a fan of the following: manuals, wagons, E30 BMWs, and M3 inline-six motors. Now you can have all four in one shot! This fully customized E30 Touring with a Euro spec E36 M3 can be found of all places, the hipster capitol of the Northeast, Brooklyn, NY. The modifications are extensive, some of which I have no idea what they mean, but I’m sure Bimmerfiles will go nuts over them. Okay...so about the price. Seller wants $42,000. No, I didn’t add an extra zero by accident. 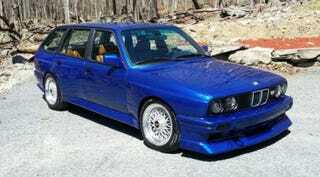 However, for the right buyer who is really into manual, BMW wagons with M3 upgrades this could be well worth it.